Back on the market and now with twice the land and a total of 5 parcels! See the sun slip down behind the tip of Catalina Island from land perched on the rim of Palomar Mountain. Property is off East Grade, historically known as "Rainbow Crest". 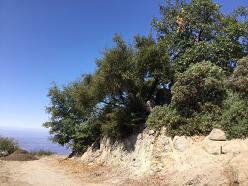 Dotted with manzanita and a few oaks. Walk down the path to a level area. 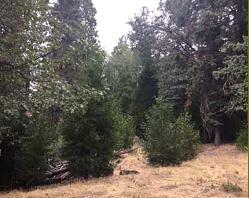 This land has been for sale in the past for twice the price and half the land. Borders National Forest on the west and south side of the land. Opportunity here! Just south of the Fire Dept, to the right and below the sunset lookout. Come away to 68 acres of old growth forest, abundant wildlife & forever views. Named "Breath of Stars", see the Observatories, amazing night sky & High Point Lookout. Tuff Shed delivered three 10x12 sheds. Now there is a charming 'Barnsita' Tiny House waiting for you plus a Bunkhouse Barn. 38 GPM well with delicious water found at 300 feet. Take the path up the hill and the glass viewing hideaway has so much potential. There are 3 canyons to explore with seasonal streams, calling out for ziplines and several different microclimates. Travel an interior road through the land to an open area with a large deck that could be a stage. What would YOUR plans be? Oh, look at all the deer! Bring a picnic to see this gorgeous land. 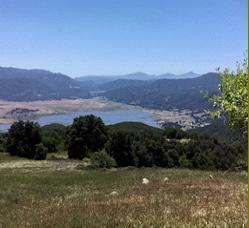 360 degree, amazing views looking over rolling meadows and beautiful oaks to Lake Henshaw and the Cuyamacas. Simply turn around and look to see all the way to the way to the west with breath-taking sunsets. Another building site offers a window to the shimmer of the Pacific. Off to the north, you see the world famous Palomar Observatory. Explore the 34 acres with beautiful meadows, majestic oak trees and some picturesque boulders. Several areas are calling out for your dream home. The owners have an orchard waiting for you with apples, peaches, apricot, nectarine, a native persimmon and cherries plus blackberries and raspberries. The well is in with a 5000 water tank. 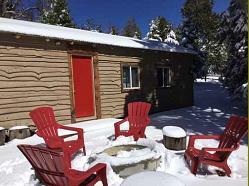 Neighboring properties are all off-grid with solar, generator and battery back-up systems. A small 5th wheel presently on the property could be an option. 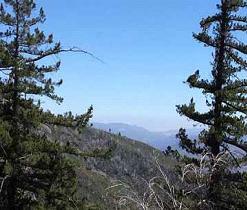 Located at the every eastern side of Palomar Mountain. Frontage on East Grade Road where the original road wove up the mountain. Surveyed, corners marked, perk test and recent well cert on file. View building area and meadows are accessed through a locked gate so not for self-touring. Very private. Is this the one? Just give me a call! Absolutely gorgeous views from private, peaceful setting. Drive right up to your fabulous building site ready to go. Build your dream or use plans owners had drawn! A furnished, charming "Tiny House" can stay or go. Lots of storage with another container, large enough to hold a tractor, two other storage options and the nicest outhouse on the planet. Power and phone is installed underground, plus a well with delicious water. Don't let the sun go down before booking your tour! Tucked away at the very end of gated Upper Meadow Road is this well-kept secret. 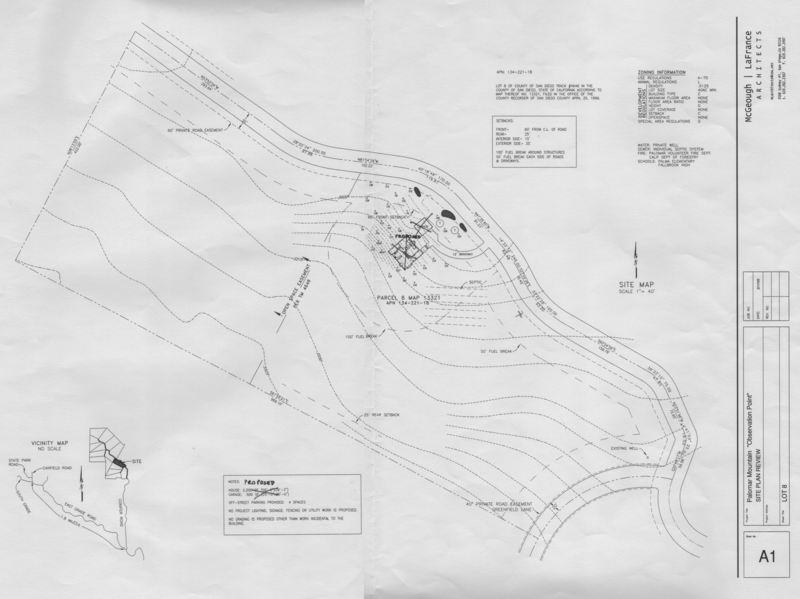 36.45 acres of delightful old-growth forest (including Hobbit trees!) with lush meadow and off-mountain views. The biggest boulders I've ever seen on Palomar Mountain are at the heart of the land. Sit in awe in this magical place looking through the trees to sparkling lights. The city is far, far away but oh-so-close for weekend getaways while you make plans for this untouched land. Underground power and phone to the corner. Come make it yours! It's all about the view! Many years ago a charming cabin was designed and built to capture the beautiful views. Enjoyed for many years as a weekend escape, unfortunately the cabin burned in the fire a decade ago. The family did a lot of clean up work on the 10.91 acres. They planted and nurtured many trees that are thriving. They recently had a masticator do some grooming to open things up a bit. A tree house was built for the kids. There is a travel trailer with an enclosed porch waiting for you and a pretty fancy outhouse plus tool shed! 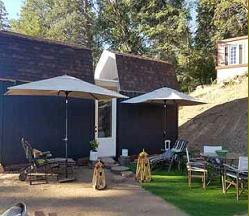 The property has a well and holding tank with a generator to fill the tank and provide gravity fed water to the camping area. Owner's sons tell of their adventures growing up visiting the seasonal spring runs that runs along the eastern property line. When I took the photos I followed deer tracks. 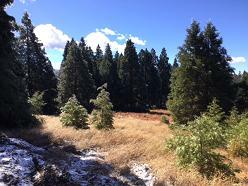 Now it is your turn with this land that borders National Forest on the easterly line. What would your plans be? An adjoining neighbor just had to have this land. 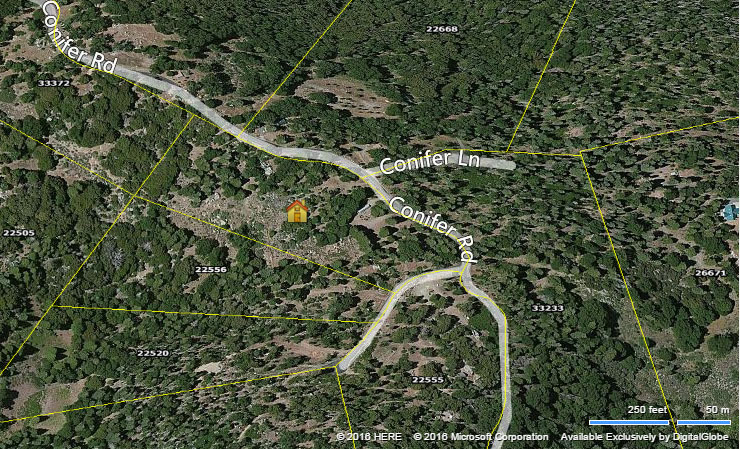 It fronts on Crestline where it is pretty steep so has 100 + year old access through Pedley Valley. There is a utility pole near the corner that has grid power and the old fashioned phone lines --remember the kind that need to be plugged in? Grooming could be done to open up a level area once again. Comp purposes only. Land was for sale when the neighbors found out and just had to have it to add to theirs as a buffer. Perk test plus many trips to the county and Fire Marshall w/building questions. Learned that very deep pockets would be needed to actually permit a home. From that corner stake on the bank, you would need to cut straight back to capture every inch of land even for a tiny house. Fabulous view but also a need for emergency vehicle turn-around that would need to be on neighboring land.